knowledge is expected and reading is FUN!! Love on a leash is committed to bringing comfort, happiness, and healing to people nationwide by increasing public awareness of pet-provided therapy. This volunteer organization provides an accessible certification process that allows a qualified therapy team to provide effective pet-provided therapy services in our community. Meet Oliver and Abigail...they will be visiting our WMS library bi-monthly with their trainers to give students the opportunity to read to them. Below are resources to assist you in finding just the right book! Book Fair was a success!!! We did not reach our goal of $2,000 in sales but we did reach $1,200 in sales and earned $500 worth of FREE books for our library!! Thanks to all who supported WMS! Dewey's Number of the Week Contest is up and running for 2018! Each week a new number will be added and students have to find the number in the non-fiction section of the library. Once found, they tell the librarian the title of the book and if correct, get a ticket to enter our weekly drawing for a prize. Once again this year we will have our Adopt a Shelf Program...Students will have the opportunity to adopt a shelf and take care of it all year! This is a wonderful volunteer opportunity for students to help out in the library! See Ms. Laws for more information and sign up! Recently the library received funding through Donor's Choice and with that funding, new shelving and books have been added to the library! This new shelf is now our "Author Spotlight". Every two months a new author will be chosen and their books will be displayed as well as a short bio about them. Each year, the ALA Office for Intellectual Freedom records hundreds of attempts by individuals and group to have book removed from libraries shelves and from classrooms. According to the Office for Intellectual Freedom, at lease 46 of the Radcliffe Publishing Course Top 100 Novels of the 20th Century have been the target of ban attempts. Stop by and see if YOUR favorite book was banned!!! 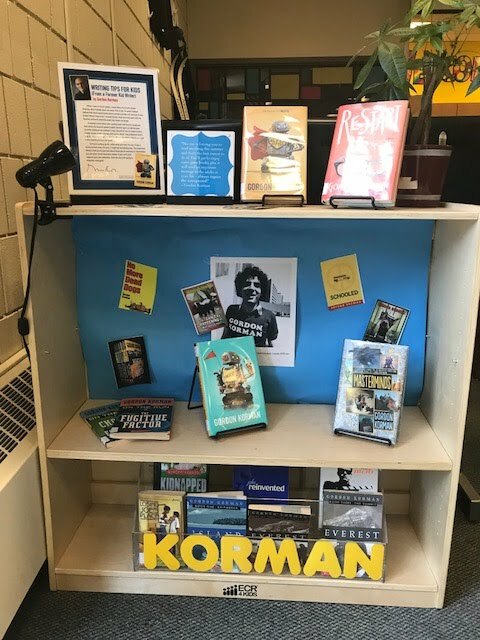 Students will have an opportunity to discover the top 10 books from 2017 that were banned along with the reasons why...they will also have the chance to vote on whether or not they would risk jail time to defend their favorite book. 1. Grab a Quick Read Book from the display. 2. Write your name on the clipboard with the corresponding number from the cover of the book. 3. Go find a place to read...perhaps by the "fire". There are 15 titles to choose from!! Marlee's Reading Room is open and ready for the 2018/19 school year...come check out something from our extensive paperback collection! !